Amigurumi Friends Kit. Amigurumi Friends are quick beginner level projects for all ages! Just stuff and stitch; they're quick and easy and require no knit or crochet skills. Simply attach the pre-knit or crocheted body parts; stuff; with fiberfill and sew them up with supplied yarn and needle. It's fun to create an entire world of Amigurumi Friends to collect; share; or give to someone special. 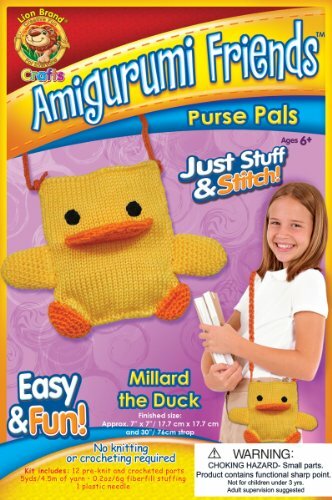 Bring an Amigurumi Friend on-the-go with Purse Pals. Each kit comes with all the pieces needed to make an adorable purse! Finished size 7x7in. Imported. View More In Knitting & Crochet. If you have any questions about this product by Lion Brand Yarn, contact us by completing and submitting the form below. If you are looking for a specif part number, please include it with your message.